USB Control software to centrally manage, monitor & block USB devices access to computers in a network. Features smart USB lockdown to protect windows endpoints from malware & data-loss by blocking unauthorized removable drives, portable devices and wireless adapters. USB Control remains an important aspect of Endpoint Security and focuses in the protection of computer systems and data assets from threats posed by the unauthorized usage of USB devices, adapters and peripherals that can be connected to computer ports. Controlling USB storage, removable media & portable devices access to endpoints is required to secure networks that control machinery or store sensible data. Removable storage is considered an attack vector by itself and a probable initial attack vector in an infection sequence. Windows Operating Systems are by design plug & play friendly to devices, this is a good feature, nevertheless in industrial and business environments access to usb ports and removable devices need to be controlled to prevent systems infection and data loss. To accomplish this, we are proud to present you, USB-Lock-RP (a.k.a., USB Lock Remote Protector). USB-Lock-RP is the strongest solution to centrally manage access to USB ports, removable storage, mobile devices and wireless adapters to servers, workstations and laptops in a network. Specialized in Protecting Industrial DCS/SCADA and Critical Infrastructure Control Systems as well as business computer networks storing sensible data. The Management application operates on-premises within the network and provides real-time control over endpoint computers. It controls mobile devices access policy and enforces rules to specific computers, as well as groups of computers with ease. Receives devices connection alerts and logs events automatically, including USB Monitoring for details on approved file transfers. Protects by authorizing (whitelist) specific USB removable drives and MTP devices by hardware ID while blocking the rest. All VID/PID/IDs are stored encrypted to prevent spoofing. (only readable within the control interface). Devices can be authorized to work on specific machines only, as well as in all the network. No need to order additional modules to protect data on authorized devices as it includes USB access control by strong encryption. Forcing encryption on approved removable drives that can be turned ON or OFF in real-time from its administrative console. Classified as Device Control Software, USB-Lock-RP is a fully independent tool, specifically designed to protect windows operating systems new or old, without concern to dependencies, at the smallest memory/storage footprint of any software of its kind. By allowing access to only authorized devices, administrators can significantly reduce the risk of systems infection by blocking USB-based exploits and other Portable devices infected with malware from entering the systems and spreading in the network infrastructure. Blocking Zero-day USB-based exploits requires USB device control because antivirus signature-based defense is useless on Zero-day cyber attacks. Off course if your network is Air gap (isolated) this is more so, as your antivirus signatures won't be quickly updated. Sensible Data stored in your organizations computers network is a most valuable asset, Using Portable devices may expose sensible data to both, outsider’s theft and insider’s unauthorized hands. Keeping this value protected from the risk of data loss, data theft is challenging. USB-Lock-RP Device Control prevention measures address this risk by disallowing access of unauthorized portable devices and forcing AES 256 encryption to authorized flash drives. Easy Client Deployment through Group Policy (Windows Installer MSI, configurable by command line). Network TCP/IP (LAN or WLAN). USB Removable storage drives: USB 2.0, USB .3.0 | Card readers: CF, SD, SDMicro, MMC, XD | Media transfer protocol portable storage: MP3 players, iPods, iPads, PDA, hand-held computers, tablets, digital cameras, mobile phones, blackberry | External magnetic hard drives: e-SATA, Firewire (IEEE 1394) | External and Internal: CD, DVD, Blu-Ray | Wireless Transceivers: WiFi, IrDA, Bluetooth | badUSB HID impostor devices | remote USB devices. Start protecting your network in minutes. Very easy to operate and set security policy. Protection scope is divided in 4 sectors; just select a client machine or computer group and press the desired lock to keep removable storage and portable devices threats away. Once set operation is automatic. Intuitive administrative GUI, virtually no learning curve involved. Authorize specific USB removable drives and/or specific smartphones access to specific computers or to all computers in the network and block the rest. Prevents unauthorized access to USB ports, removable storage, portable devices and other Removable Media from accessing operating systems in the network. Allows to set or change security measures and automatically receive and log details on blocked, and authorized devices as they are plugged into endpoint computers in real-time. As well as logging and receiving records of files transferred from endpoints to authorized USB Devices as events occur. Designed to control USB port access without interfering with non-storage USB peripherals (mouse, keyboards, webcams, printers), But capable of detecting and unobtrusively protect against keystroke injection and malicious payload attacks by devices such as BadUSBs (USB Rubber Ducky) that impersonate HID keyboards or mouse. Effective monitoring of data/files transferred from endpoint computers to authorized USB portable storage (thumb/flash/pen drives). Records automatically arrive and are stored secured at the Control server. The Administrative Console can be set to send these records to a SMTP (TLS/SSL) email within your domain in real-time. Protects information contained inside authorized Thumb drives by optionally forcing automatic AES 256 encryption of all transferred data/files from network endpoint computers to allowed USB devices, Effectively provides USB access control to protect sensible data in cases when the authorized device is lost or stolen. USB Encryption policy can be enabled or disabled with just a click. Licenses are End-user Organization Perpetual use Licenses and include 2 years updates, after 2 years updates are optional at 20% of licensing cost. USB-Lock-RP is not support demanding, once set it works as intended, this has to do with product maturity and that at client-side it deals with hardware, not users. Support is in English at no charge by email or phone. Doesn’t require internet or Active directory. Protects even if client endpoint is disconnected from the network. Protects at System level. (effective even if running under administrative account.) Starts protecting even if no user is logged into the system. Works on air-gapped networks and remote locations. Fully functional DEMO ready for download. Test how USB Lock security software, manages USB ports and Devices access to endpoints with ease and monitor authorized Thumb drives without time limitation in up to 5 clients. Dedicated team on stand by to assist on any questions you may have (24x7). USB Lock Client can be mass deployed as Group Policy Object in Active Directory Environments, USB Lock client is presented as a standalone Windows Installer MSI that is configurable by command line, ensuring effective initial client deployment and updates. Refers to the protection of the Network Endpoint Computer Running Windows Operating System. It can be a Server, Workstation or Laptop. To effectively protect the endpoint a USB-Lock-RP client is deployed and operates as a system service locally. Besides local enforcement of policy the service purpose if to communicate with the USB-Lock-RP Control Application. The Control Application is installed on a Server inside the network and operates independently as the Centralized Administrative Console. 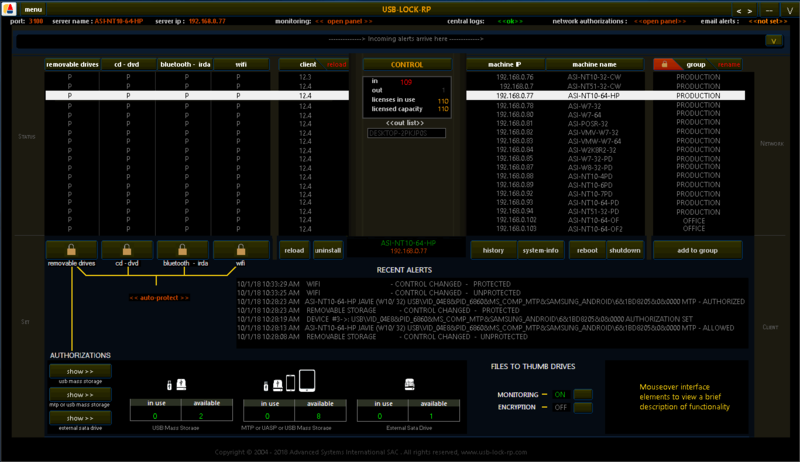 Its main function is to centrally control devices access to Endpoint ports, Receive alerts and logs events. Refers to blocking access to data contained inside authorized USB flash drives (e.g.,Thumb drive, Pen drive, Memory Stick). Access is restricted by automatically forcing strong encryption, To all files transferred to the protected USB drive. There is no software installation required inside these devices as the USB-Lock-RP service is in charge of Monitoring, Encryption and Decryption. This method effectively protects data inside usb removable storage according to the Control Application policy setting (Auto encryption can be set ON or OFF in real-time). Refers to automatically blocking access to the computer desktop. Lockdown occurs when unauthorized USB storage devices (e.g.,USB 2.0, USB 3.x) are connected to the usb ports (e.g.,standard USB type-A, USB type-C), or remote USB. USB-Lock-RP considers the unauthorized connection of usb storage devices a serious intrusion attempt that should be stopped by all means, USB Lockdown (blocking) is part of the software redundant measures applied to protect the system. This measures take place upon detection and included preventing drivers to load, stopping, dismounting, disabling, ejecting devices and also blocking access to the desktop. Protection measures escalated depending on the device type and the device status but lockdown is normally included when blocking usb and other removable storage under the software protection scope. Select a client PC from the USB-Lock-RP management console network list. Click on the left side lock. Done!, you have just protected the selected computer removable drives sector. Now the following devices will be blocked: USB, eSATA and Firewire drives, Mobile phones (MTP Protocol), Smart cards while also smart blocking USB keystroke injection attacks. By default 5 groups are created, and all new installed clients will belong to group 1 as seen on the groups column, so you are ready to block removable storage on all computers at this point. Click the Group security button and choose the group name, sector (e.g., Removable drives), desired action (e.g., Protect) and press OK.
Great! you just Locked down removable drives sector on all computers that belong to the chosen group. You will see all computers in that group changing its security status to protected in real-time. Authorizing specific USB pen drives and Mobile phones is as easy, just insert the device you need to authorize (at the control or at the client) and press authorize. Done! Besides USB Control (Removable Storage Sector), Three other sectors to manage are available and are as easy to protect: CD/DVD Sector, iRDA/Bluetooth Sector, and WiFi Sector. All blocked or authorized device connection to any client computer automatically generate an alert event stored encrypted at Control server. This records are readable from within the Central USB-Lock-RP Device Control Interfase and show date-time, Hardware ID, logged user & machine name. All blocked devices at endpoint client generate a full screen alert visible at client bearing the licensed organization logo at top-left corner. Monitored data include the name and exact weight of transferred files from the client endpoint PC to flash drives, logged user, device hardware ID, source machine name, date/time when the event started. Records are sent encrypted AES 256 hex masked from the endpoint computer to the control in near real-time and are organized at the control by endpoint machine name/date/time for review as needed. At the Central control server the collected data remains encrypted and same as all device insertion attempts records is only readable within the Device Control interface. USB Access Control is done by forcing automatic Encryption, this function can also be turned ON or OFF with just one click. (USB Monitoring needs to be activated for Encryption to work). This function ensures that information contained inside authorized devices is only accessible within determined computers in the network and none outside the network. Included in the removable drives sector is protection against badUSB device e.g. USB Rubber Ducky, this type of device is extremely dangerous as its firmware has modified to impersonate Human interface devices (HID) such as keyboards. This class of BadUSB can inflict keystroke attacks and introduce malicious payloads to harm the operating system and network infrastructure. Blocking USB of this type is a standard function in USB Lock, the program makes a quick analysis when detects any change on keyboard/mouse enumeration to prevent such attacks, other than that keyboards and mouse work normally without restriction. USB Lock RP Endpoint security that is not a pain in your end!. USB Lock RP not only allows you to maintain control and have flexibility. It gives you peace of mind when it comes to endpoint security and removable devices and more importantly is gets rid of PEST! USB Lock RP Centralized Direct means of organizations information protection. USB Lock RP is also one of the only pieces of USB control software that personalizes block screens and relevant boxes with a customer’s logo. This builds USB Lock RP into a company’s policy and gives each and every client a feeling of personalized control. USB-Lock-RP is Centrally Managed USB Control Software that comes with perpetual use license, reasonable cost, operates without requiring internet connection, and offers its service as a tool you can call your own. No matter how big or small your network is, USB-Lock-RP is designed for performance and scalability, effectively protecting computer Networks of any size. We invite you to Download & Try USB Lock Software free non-expiring Demo to handle USB Control in your network.